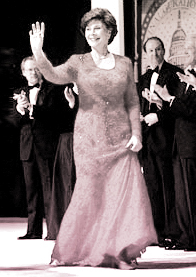 First lady Laura Bush waves as she arrives on stage for a Presidential Inaugural Ball at the Marriott Wardman Park Hotel in Washington, Jan. 20, 2001. 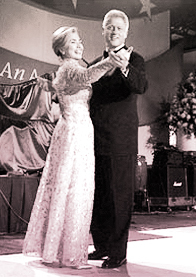 President Clinton and his wife, first lady Hillary Clinton, dance at the New England Ball, Jan. 20, 1997, in Washington. 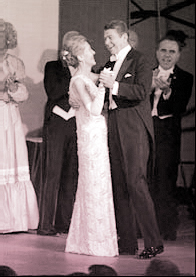 President Ronald Reagan and his wife, Nancy, dance Jan. 20, 1981, at an inaugural ball at the Pension Building in Washington. 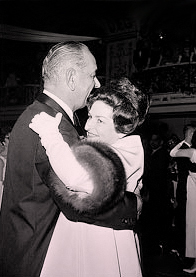 President Lyndon B. Johnson and the first lady, Lady Bird, dance at the Inaugural Ball at the Mayflower Hotel in Washington, D.C., Jan. 20, 1965. 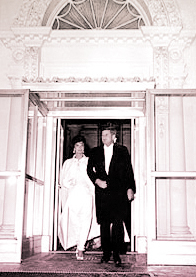 President and Mrs. John F. Kennedy leave the White House, in Washington, D.C., on Jan. 20, 1961, for a series of visits to inaugural balls. 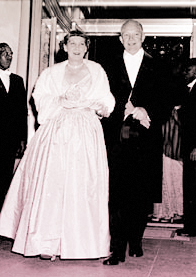 President Dwight Eisenhower holds the arm of his wife, Mamie, as they leave the White House en route to inaugural balls in Washington, Jan. 20, 1953.